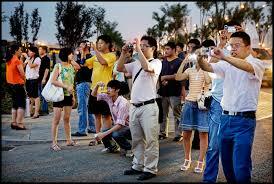 A recent report by the World Tourism Cities Federation (WTCF) provides instructive information on Chinese tourists. The most significant statistic – and the one that causes such allure for Chinese tourism – is the amount of money spent by Chinese tourists. In 2013, 98.19 million Chinese travelled abroad, spending US$128.7 billion – an increase of 26.8% from 2012. Of that huge sum of money, 57.6% was spent on shopping; 17.82% on accommodation; 10.88% on transport; 5.84% on food; and 7.4% on entertainment. The number of Chinese touring abroad also increased by 18% in 2013 over the previous year. However, there are many challenges to the task of pursuing a share of the large Chinese tourist spend. For example, the majority of Chinese tourists – 56.21% of them – earn about US$1,600 per month and 22.26% earn US$2,400 or more. These figures suggest that given only the cost of travel, Chinese tourism to the Caribbean will be limited to a smaller, high-end market. This conclusion is re-enforced by figures which show that the four most popular destinations for Chinese tourists are cities in nearby South Korea and Japan to which the cost of travel is considerably less than long-haul flights. Of course, smaller numbers of Chinese are also travelling to Europe and North America, but surveys indicate that they want – and expect – better services, including persons proficient in the Chinese language at hotels, shopping centres and tourist sites; security from crime; and sensitivity to their cultural differences. To attract a portion of the Chinese tourists who can afford to travel beyond their neighbouring countries, the Caribbean will have to learn from the experience of European and North American countries in catering for them, including showing them respect. US airlines and US Airports are working hard to gain more Chinese business. For instance, American Airlines launched new routes in to Shanghai and Hong Kong from its hub at Dallas/Fort Worth International Airport in June. Not to be outdone, Delta Air Lines launched a non-stop flight between Hong Kong and Seattle in the same month, and United Continental Holdings added a route from San Francisco to the central Chinese city of Chengdu. All the airlines cited “the consistent growth in the number of Chinese leisure travellers venturing abroad” as the basis for their investment. Interestingly for the Caribbean countries that enjoy ‘designated’ tourism status by the Chinese government, this year, Air China also launched non-stop flights between Beijing and Washington, D.C, while the smaller Hainan Airlines, which had already been flying routes to Seattle, Chicago and Toronto, launched a service between Beijing and Boston. It is with these airlines that Caribbean Tourism agencies and airlines could usefully engage.